All types of vehicles were on display as well as the drivers. Big tires, lots of toys and shiny cars were the name of the game. 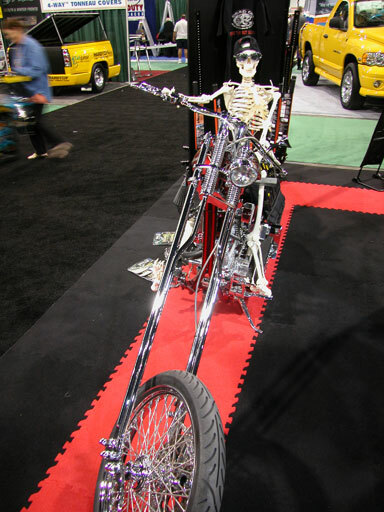 This biker must have traveled too many miles to get to the SEMA show. But what a nice bike! 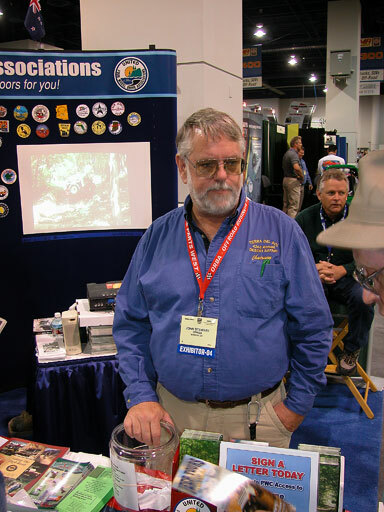 John Stewart, United 4Wheel Drive Associations staffs the United booth and gives visitors the run down on access issues. John is also a Natural Resources Consultant for the Calif. Association of 4WD Clubs. SEMA is a great show as well as a great organization. They fight for our smog and lift laws among other issues. We are partnered with them in all our access issues. They also sponsor a room during SEMA for the North American Motorized Recreation Council (NAMRC) meeting. Thank you SEMA. All rights reserved by US Copyrights Office. Use of material on this web site available by permission only.